Though Limor Max and Sharon Ken-Dor are such newcomers, they immediately detected in the city’s troubles a potential cure. “It seems like people in Israel can’t speak civilly to each other anymore. As artists, we wanted to challenge that by creating art from a war zone as a way of bringing people together,” says Limor. So they organized Umm Culture House, which gathered 18 artists of all disciplines—painters, performance artists, photographers, videographers, sculptors and many more—to create pieces that address common local themes, such immigration and demographic changes. Displayed in Sderot businesses and public spaces, their work sparks conversation among locals, newcomers and tourists about life in the South. There was just one problem: Limor, Sharon and the other artists didn’t have the resources to devote themselves full-time to Umm. So they turned to Federation. Looking for a boost, they entered the Negev Creative Placemaking Challenge, sponsored by Federations’ Negev Now initiative. A project of Federations’ Negev Funding Coalition, Negev Now works to increase the vitality of Israel’s south for current and future residents, driving both innovation and economic growth. The Creative Placemaking Challenge is one of its most innovative programs. 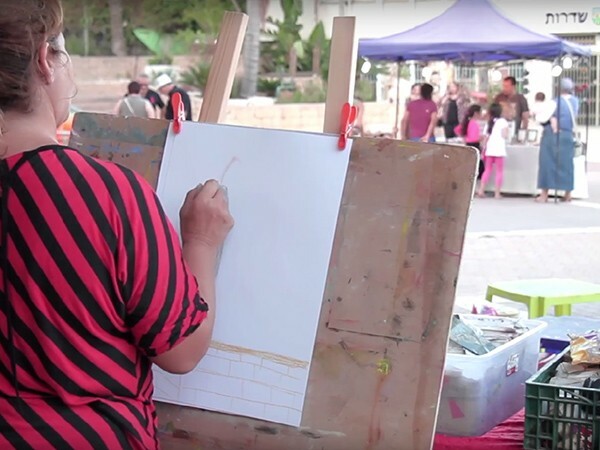 It convenes artists, urban planners, civic leaders and other Negev stakeholders to develop transformative cultural projects that breathe new life into cities like Sderot. It’s the first competition of its kind in Israel. Naturally, Umm Culture House was a shoo-in for the prize. With this investment, artists at Umm Culture House are able to keep doing the work they love for their neighbors. “When people see our art, it touches them very personally. They cry, they are euphoric,” Limor says. More importantly, Umm art’s celebration of Sderot’s great diversity continues to spark much-needed dialogue about the future of the region.